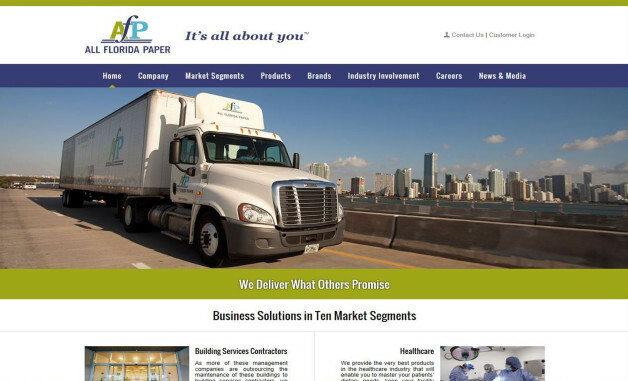 Medley, FL – All Florida Paper (AFP), a leading privately held distributor in the United States launched their new industry leading website and corporate identity in the month of December in 2013. According to Armando Caceres, All Florida Paper’s President and CEO, the new website is second to none in the industry. It provides many new features for our customers to utilize. From Market Segments and Product News to Featured Products and Brands, we have everything that our customers could ever want from a distributor’s website.” In addition, the new website and brand refresh are more closely aligned with the company’s strategic vision for growth and expansion for years to come. The new industry leading website features a clean, modern design, with easy-to-navigate functionality, and a content-rich site experience. The online catalog function enables customers to quickly and easily view products and submit quotes from a broad range of categories, including food service and cleaning supplies, chemicals and safety equipment, paper products, janitorial and sanitation supplies as well as retail products. According to Marisel Caceres, the COO at All Florida Paper, “this world-class website does not in any way replace the exceptional industry leading customer service that you have been accustomed to for over 20 years. She continued by saying, “our goal in launching this website is to provide one more access point and online resource for local and national businesses to learn more about our business solutions, and how partnering with us will create a brighter future for your own business. The new industry leading website also provides social media integration, and direct links to the company’s social media pages, including Facebook, Twitter, and LinkedIn, where company and product updates will appear on a regular basis. “We have stayed in business for over 20 years by listening to our customers, and building one-on-one relationships,” Armando commented. He continued by saying “this is an old-fashioned company with core values, but we also recognize the importance of constantly innovating and adapting to new ways of doing business and investing in technology.